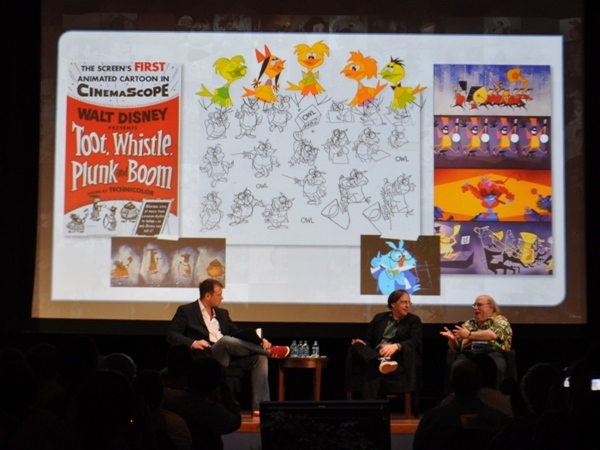 The first presentation of day two was from historian Jerry Beck and Disney animator Eric Goldberg. It focused on wacky Disney animation from Alice In Wonderland, The Three Caballeros and of course, the pink elephant segment from Dumbo. 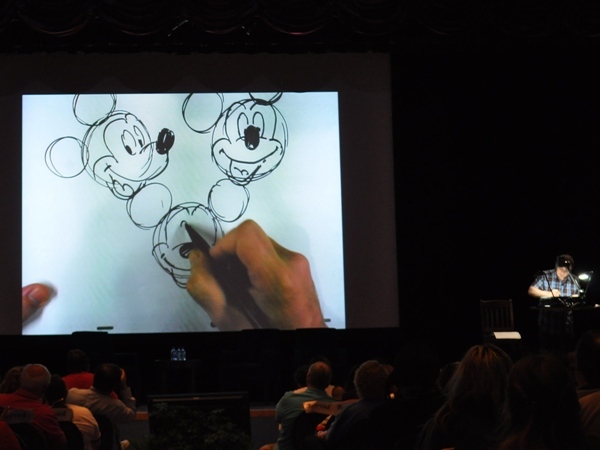 Next, Disney animator Andreas Deja shared some sketches from some of his favorite animators, plus showed how to draw a few of his favorite characters, including Mickey. He commented that he thinks villains are the most fun to animate…his favorite being Jafar. Historian and author Mindy Johnson took the stage next to talk about some of things she discovered while researching her new book Tinker Bell: An Evolution, which traces Tink from even before J. M. Barrie’s play. 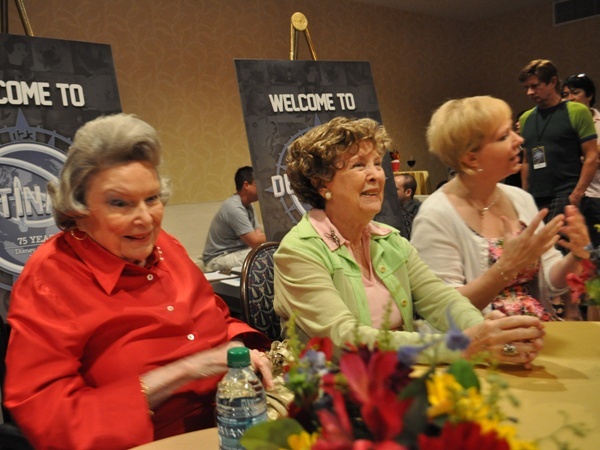 Many Disney fans know that Margaret Kerry [center below] was the body model for Tinker Bell, but Johnson was able to confirm that “ink and paint girl” Ginni Mack [left below] was the face model. 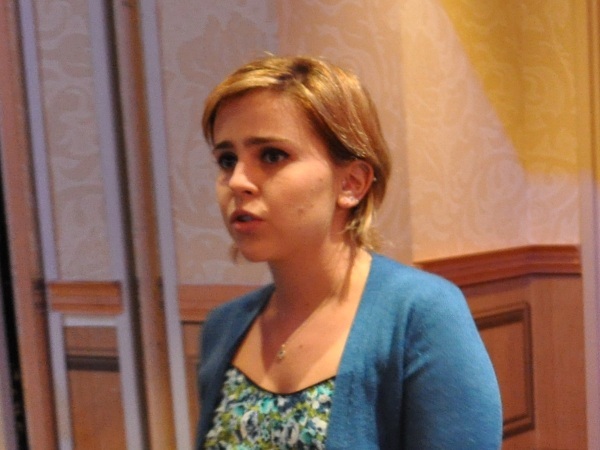 We were then treated to a clip from the upcoming Secret of the Wings and a brief chat with director Peggy Holmes and Mae Whitman, the voice of Tinker Bell. 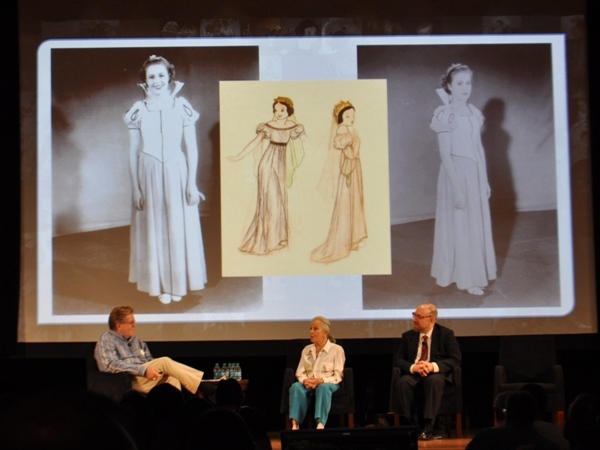 Whitman shared that someday she hoped to be up on stage talking about Tinker Bell at Mack and Kerry’s age, while a new generation is next to her keeping the character alive. 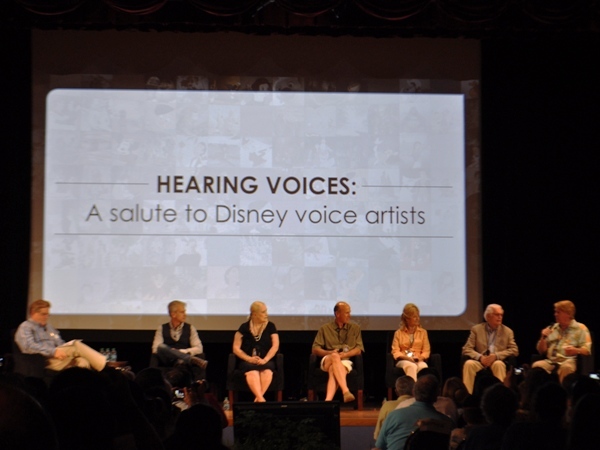 In the afternoon, a large panel of voice artists took the stage to share what it was like working on some of Disney’s classic films. [From left, historian Tim O'Day, Chris Sanders (Stitch-Lilo & Stitch), Lisa Davis (Anita-One Hundred and One Dalmatians), Bruce Reitherman (Mowgli-The Jungle Book, Christopher Robin-Winnie the Pooh and the Honey Tree), Kathryn Beumont (Alice-Alice in Wonderland, Wendy-Peter Pan), David Frankham (Sgt. Tibbs, One Hundred and One Dalmatians) and Bill Farmer (Goofy).] Davis shared the story of auditioning with Walt Disney for the role of Cruella DeVil, who Walt wanted to sound like Zsa Zsa Gabor. Davis had worked with Gabor on a film and had done an impression of her on several television appearances, which Walt had seen. After struggling during the audition, Walt asked her if she felt like she was “more of an Anita”. They both agreed that she was. Finally, historians Tim O’Day and Alex Rannie discussed Walt Disney’s first animated feature, Snow White and the Seven Dwarfs. Rannie is also a noted musicologist and shared some original sheet music unused music slips. Later, reference model Marge Champion joined them in a rare appearance to talk about her involvement in the making of the classic film. 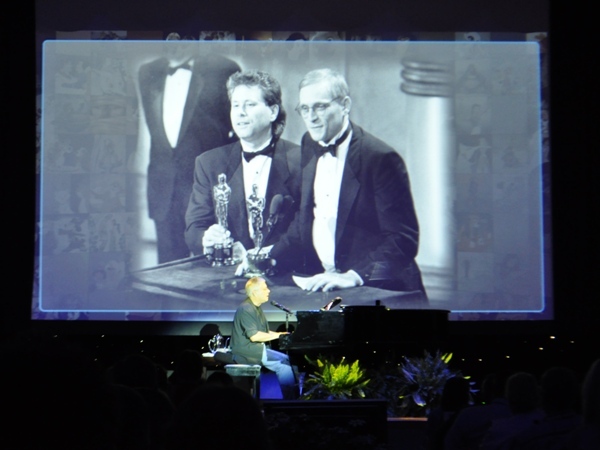 To close out Destination D, D23 presented “An Evening With Alan Menken”. The 8-time Academy Award winning composer is responsible for the music of some of Disney’s most memorable films, from The Little Mermaid and Beauty and the Beast to Enchanted and Tangled. Menken played for over an hour and a half and shared music from nearly every show or film he’s ever worked on, including the non-Disney Little Shop of Horrors and Sister Act-The Musical. 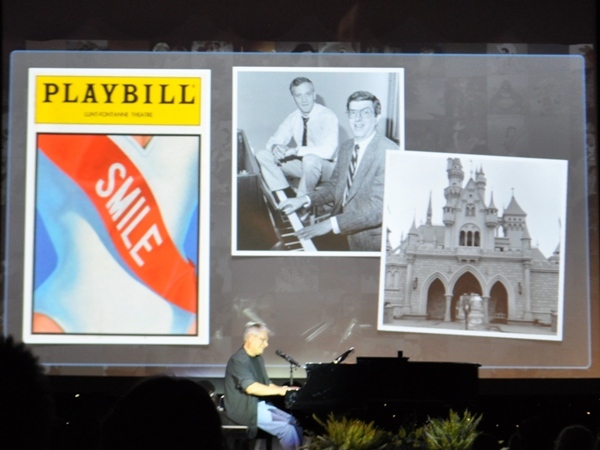 Along the way, Menken saluted his late writing partner Howard Ashman, who along with the recently deceased Marvin Hamlisch wrote Smile, featuring the song “Disneyland”. 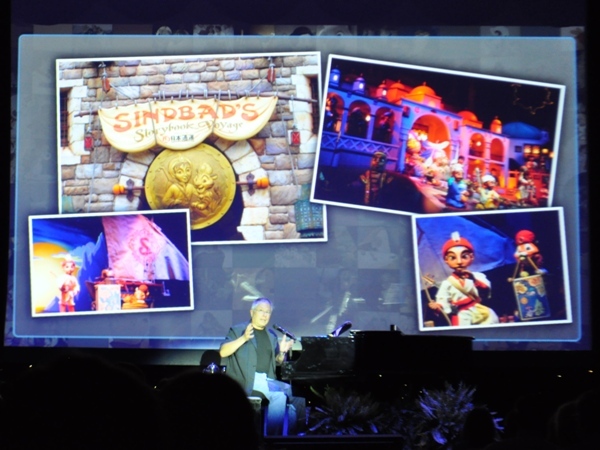 Menken also shared a song he wrote for Tokyo DisneySea, which, surprisingly enough, he’s never been to. Menken closed out the show with one of my personal favorites, “Proud of Your Boy”, a song that was written for Aladdin, but removed after a script change. The song has found its way back and is being worked into the upcoming Broadway version of the film. D23 put together a great line of of presentations and two wonderful concerts for this year’s Destination D, and while the $225 price-tag was a bit steep, I wouldn’t have missed this weekend for anything. 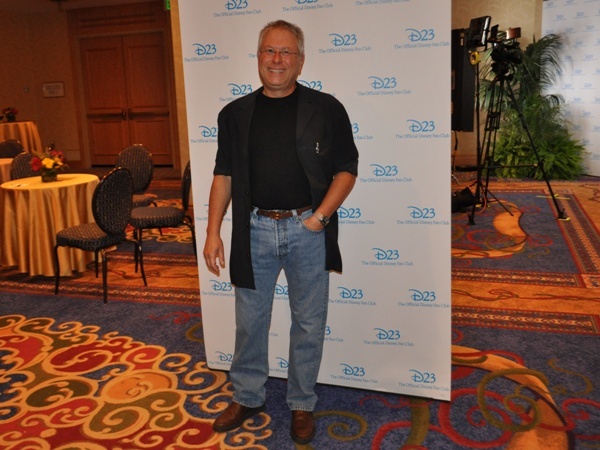 Don’t tell D23, but I probably would have paid $225 for the Alan Menken concert alone…..shhhhhhh. 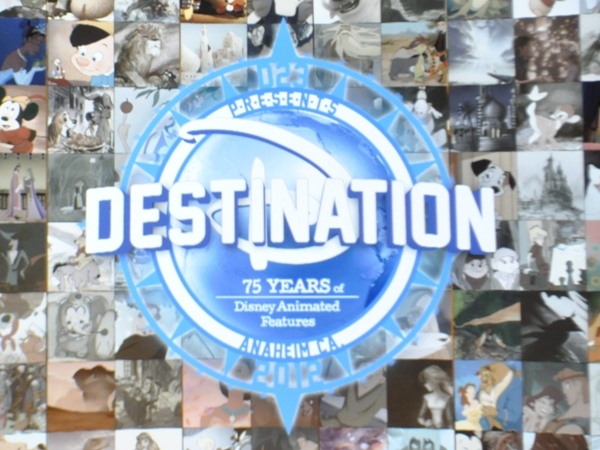 For me, Destination D continues to be the better option over the D23 Expo and I, for one, hope it continues.